I love to learn and have earned two AAS in quality science, a BS in biology with a minor in chemistry, an MA in earth literacy. The earth literacy program is interdisciplinary learning that fosters the capacity to understand the natural world in order to ensure sustainability of the planet as a habitat for life. I am a firm believer in the importance of diversity and want to teach this importance to the next generation. On a personal note, I am happily married to a wonderful man (Shawn Doan), and we enjoy living in Indiana raising our four-legged children together. My intent and vision for the Neighborwood series is to connect children and nature to teach earth literacy to them. I have acquired my MA in earth literacy, and my thesis was teaching earth literacy to kids. My project was this book (Neighborwood: Earth Literacy for Kids), and I have many ideas for the series. Here is my abstract from my thesis: Abstract The themes presented in the earth literacy program are concepts that need to be taught at the beginning of one's education, not at the end. This is the vision behind Earth Literacy for Kids. The Neighborwood series will consist of sets of books that will illustrate the various earth literacy master's program themes, such as the importance of diversity, recycling, and sense of place. The animals that reside in the forest of the Neighborwood are the characters that will be learning the themes along with the reader. The guide through the journey will be the Neighborwood land ambassador, a girl whom they call Lamb. The first book will be part of a pen pal series that shows the importance of niches and diversity in communities. This book will have a country mouse and a city mouse as pen pals learning how they are similar and how they differ. The rest of the pen pal series will include land turtle and sea turtle pen pals, and mockingbird and African grey parrot pen pals. 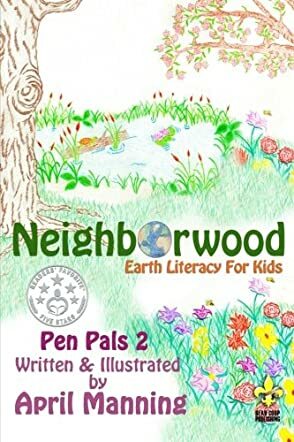 Neighborwood: Pen Pals 2 (Volume 2) by April Manning is part of a series of fun educational books for children. Neighborwood is a forest habitat where all sorts of fascinating plants and animals can be found. Squirrels work away at gathering nuts etc, bees pollinate flowers and affect our lives in many vital ways, plants soak up excess water in the ground and give off oxygen, and the turtle has an important role to play too. The turtle and the sea turtle both write pen pal letters explaining what life is like for them, and the reader is invited to find similarities and differences in the environments and behaviours of these two creatures. April Manning's book would be an excellent addition to a class library or for use as a teaching resource that helps children learn about different habitats. It is well written in a good sized font, short sentences, and in a style that will engage the interest of children. Young readers may read the book themselves or it would be very suitable to read aloud to a group of children. There is just the right amount of information to inspire children to find out more about forest habitats and I like the way the author poses questions. The idea of the turtle and sea turtle writing letters to tell us about their lives is lovely. The text is complemented with charming, light, full-color illustrations on every page that contain plenty of detail – just right for encouraging further thinking and observation. Children will love the gorgeous little creatures and especially, I’m sure, the tiny snail carrying the turtle’s letter. Neighborwood is a fun and colorful book that helps children learn about the world around them.